Fortinet, the global leader in high-performance cybersecurity solutions, today announced the addition of 11 industry-leading information technology providers to its Fabric-Ready Partner Program. These new partners further extend the Fortinet Security Fabric across traditional, cloud, virtual and software-defined environments while simplifying multi-vendor security deployments for enterprises. 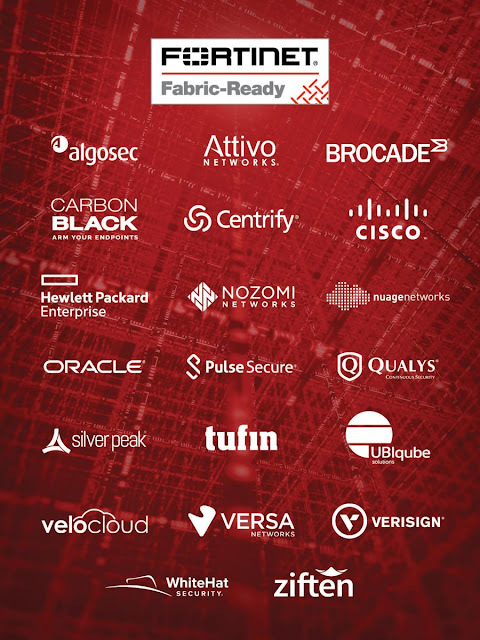 New Fabric-Ready Program Partners include ADVA Optical Networking, Bradford Networks, Cyber Observer, CSPi, FireMon, ForeScout Technologies, Intel Corporation, Microsoft Azure, Ribbon Communications (formerly Sonus Networks) and SentinelOne. The Fabric-Ready Partner Program builds on Fortinet’s robust ecosystem of technology alliances by opening the functionality of the Fortinet Security Fabric to complementary solutions. Partners in this program validate technology integration with the Security Fabric, have committed to sharing roadmaps for consistent interoperability, and will benefit from joint go-to-market initiatives. To date, Fortinet has brought together 34 Fabric-Ready Program Partners, representing a cross-section of leading information technology providers to deliver pre-integrated, end-to-end offerings ready for deployment, reducing the technical support burden and costs for enterprise customers. Enterprises today are adopting new technologies and cutting-edge infrastructure strategies to enable continued growth in today’s competitive digital economy. Most of these organizations have deployed networking and security solutions from multiple vendors, which can pose significant challenges for IT teams to integrate and efficiently operate multi-vendor solutions across heterogeneous environments. The Fortinet Security Fabric enables customers to maximize their existing technology investments through the Fabric-Ready Partner Program. Working together, Fabric-Ready partner solutions can leverage Fortinet’s well-defined APIs (Application Programming Interfaces) for deep integration with the Fortinet Security Fabric. This integration further extends Security Fabric capabilities across cloud, virtualized and software-defined environments and ensures seamless interoperation with partner solutions and services. Cloud: Microsoft Azure and Ribbon Communications. Endpoint, IoT (Threat Detection & Response): SentinelOne and ForeScout Technologies. Management: Bradford Networks, Cyber Observer, CSPi and FireMon. Virtualization, SDN, NFV: ADVA Optical Networking, Intel Corporation and Cloudify. "VNF on boarding is a big challenge for the industry. Cloudify took a path informed by engagement with ETSI/NFV, OASIS TOSCA and the ONAP project. Our goal was to show that VNF deployment can happen on existing infrastructure in a fraction of the time and risk. A big advantage Fortinet has—in addition to platform flexibility and superior support—is its wide selection of supported public and private cloud platforms. So does Cloudify, and together we can address a wide array of multi-cloud and hybrid-cloud scenarios—and going forward, edge-compute—on both brownfield and greenfield deployments." Gear Up for a GEM-Packed Holiday! Celebrate Thanksgiving Day at Burgoo!